Melaka is reputed as the treasure trove of Malaysian legends, legacies and charm. Melaka is said to have been founded by an exiled Sumatran prince, Parameswara. While hunting in a village, he stopped to rest under a tree called Pokok Melaka. He then saw one of his hunting dogs being kicked by a mousedeer. He was so inspired by the mousedeer's courage that he decided to build his empire at the spot where he sat, and named his new city Melaka. The city attracted spice traders from as far as Europe and South America. Control of the city changed hands first from the Melaka Sultanate, to the Portuguese, the Dutch and then, the English. Melaka today is a kaleidoscope of rich heritage. The State may have lost the pomp and grandeur of atrading empire but the legacy is left which is visible in its many historical relics, the language of its people, its cuisine and traditions. Red, White, Yellow and Blue refers to the colours of the Malaysia national flag called "Jalur Gemilang" or Glorious Stripes, that signifies the Melaka state as part of Malaysia. The crescent and star symbolises the Islamic religion as the official religion of the State and Malaysia. Kesidang reflects the average personality/character and role of the Melakans whom are generally courteous and friendly. The flower is normally used by the traditional Melaka womenfolk as a hairpiece, bride dressing and at various official functions. It emits a soothing fragrant smell that last. 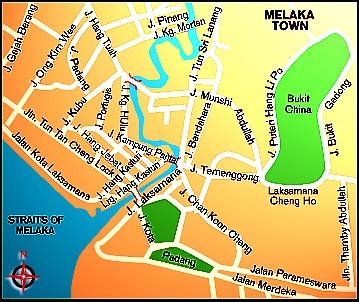 The Melaka state is divided into the three districts with each district having its own district council [Majlis Daerah]. Bahasa Malaysia is the official language, but English is widely used for business and in the tourist industry. Mandarin and Tamil are also familiar local languages, and are taught concurrently with Bahasa Malaysia and English Language in the education language. The Melaka Chinese basically comprise of Hokkien chinese and explains the widely use chinese language in Melaka. You would also experience the Portuguese descendants speaking their own language called "Kristang" and the Baba Nyonya community speaking a language of their own which is a mixed of Hokkien and Bahasa. The tropical climate is hot and humid throughout the year, with plenty of sunshine, and temperature ranging from 21 to 32 degrees Celcius. Cooler climates can be found in hill resorts. The annual rainfall is high, from 2,000 - 2,500 mm. Distinct rainy seasons, caused by the monsoon occur on the West Coast (August-September) and on the Peninsular east coast, and East Malaysia in November to February. Daily rainfall is often concentrated during the late afternoons, bringing refreshing air in the early evening. One Ringgit Malaysia(RM) is equal to 100 sen. Currency notes are in denominations of 2, 5, 10, 20, 50, 100, 500 and 1,000 Ringgit value. Coins are 1 Ringgit, 1, 5, 10, 20 and 50 sen.
Travellers cheques can be exchanged for Ringgit Malaysia at commercial banks, hotels and at authorised money changers. Major international credit cards, including American Express, Visa, Mastercard and Diners Club are accepted at most hotels, shopping complexes and restaurants. Both international and local banks operate in Malaysia. There are also a number of merchant bankers, finance companies and offshore financial institutions established in Malaysia. Banking hours are between 9.30am to 4pm on weekdays and 9.30am to 11.30am on Saturdays in most states. The exceptions are the states of Kedah, Perlis, Kelantan and Terengganu where banks are closed on Fridays and from 9.30am to 11.30am on Thursdays. Cool attire of natural fibres, cotton or similar is most comfortable. An overjacket or jumper may be needed for cool nights in the hill resorts. For the more formal occassions, a jacket, long-sleeved shirt, sometimes a tie, are required for men and evening dresses for women. Long-sleeved Batik shirts are also accepted for formal functions but advisable to check the dress-codes required for the functions.Visitors must respect the dress-code required when visiting mosques and temples. In Perlis, Kedah, Kelantan and Terengganu, Friday is the weekly holiday instead of Sunday. Government offices, banks and most shops are closed. In all other states, shops are generally open from 9.30am to 7pm, with later closing times for supermarkets and department stores. Government offices operate from 8am to 4.15pm with one hour lunch break, extended to 2.5 hours on Fridays. Private offices operate from 9am to 5pm and on Saturday mornings. Many large shopping complexes are open seven days a week between 10am to 10pm. Malaysia has an advanced telecommunications system in which internet, telephone, telex and facsimile services are available at reasonable rates. Malaysian time is eight hours ahead of GMT. The voltage is 240V at 50 cycles. Adaptors are easily available at all hotels or electrical outlets. 115,Taman Melaka Raya, Off Jalan Parameswara, 75000 Melaka. 198 & 199, Taman Melaka Raya, Off Jalan Parameswara, 75000 Melaka. No 28 & 30 Jalan Sri Rama 3, Tmn Muzaffar Shah, Ayeh Keroh 75450 Melaka. 251,Jalan Tun Sri Lanang 75100 Melaka. The best teow chew porridge.Also try their home cooked assam fish. 133 - 2B,Taman Melaka Raya, Off Jalan Parameswara, 75000 Melaka. 52-62 & A, Jalan Mutiara Melaka 2, Bt Berendam 75300 Melaka. Opposite Chung Khiaw Bank, Lorong Hang Jebat, Melaka. Traditional Hainanese style chicken rice is served golf ball size and is simply delicious. Adjacent to Chung Khiaw Bank, Jalan Hang Jebat, Melaka. Chop Chong Hwa's neighbour. Their chicken rice is served golf ball size (larger) and equally tasty. 1A, A Famosa Sample Hse, Pegoh Est Simpang Empat,78000 Melaka. Jalan Air Keroh, 75450 Melaka. Lock Bag No 1951, Bemban Post, 77209 Melaka. Taman Melaka Raya, 75400 Melaka. 41A, Jalan Bendahara, 75100 Melaka. My advice is to head straight to Taman Melaka Raya and you will have lots of choice ranging from pubs, discos, nightclubs and canteena styled pubs.